I am not a big fan of stem ginger, never have been but ginger in other forms is something I do like the taste of, especially in biscuits and cakes. 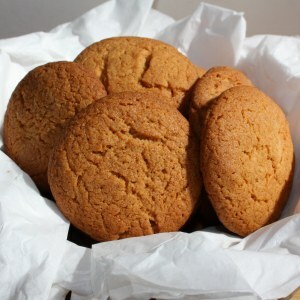 Gingernut biscuits have a warm slightly spicy taste to them. They are just the perfect constituency for my habit of dunking in a cup of tea. Unlike other biscuits that are easily broken or crumble, these are a little more robust. I had forgotten how easy they are to make and how good they taste. The only thing I will say is that they do need watching whilst in the oven. Just before the baking time is up, check them and if needed, turn the baking tray round to stop the edges from burning. 3 oz/ 75g golden syrup. In a bowl put the flour, bicarbonate of soda, ginger, cinnamon and sugar. In a pan heat the butter and the syrup together until the butter melts. Start the butter off on medium heat – you need to watch the butter, as you don’t want it to burn (burnt butter can nearly always be detected in the finished product). Once melted pour into the dry ingredients and mix well, using a wooden spoon. Lightly flour your hands and take an overloaded teaspoon of gingernut dough, roll into small balls, place well apart on greased baking sheets and flatten slightly with the back of a spoon. Bake in the oven at gas mark 5/190C/375F for about 15 minutes. Cool for a few minutes before lifting off baking sheet and place on wire rack to cool. The cracked top that appears, is normal, this is supposed to happen. Keep in an airtight container.